"Relative Happiness" a funny feel-good romantic comedy that deals with the different levels of happiness for different individuals. The opening salvo of the film is a picturesque view of the country side that led to a fun scene on wedding fittings. The film has a "Modern Family" comedy feel that would surely keep you laughing. "Relative Happiness" has a perfect balance of humor and a dash of drama that would make you think "Yeah, I also feel like that sometimes." 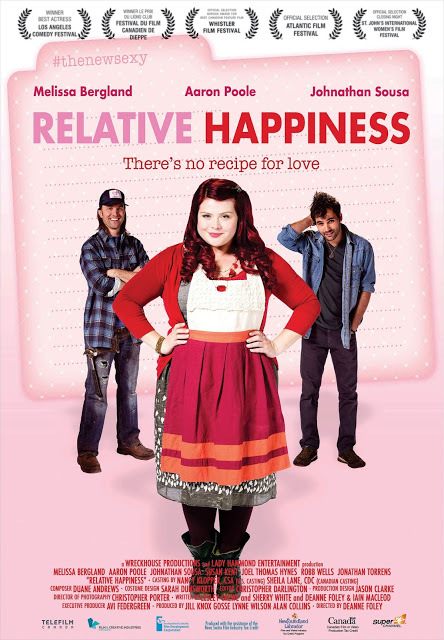 Watch the Full trailer of Relative Happiness: There's no recipe for love! Melissa Berglandin has a similar vibe to Rebel Wilson, just a little sweeter. There is an intimate number of main characters. There is this unique cozy way in how the "Ivy’s Bed & Breakfast" was presented. You would simply want to try and spend a night in the place after watching it. We love that the film presented a realistic and imperfect world that we usually don't see in films. They tackle low and high points in the lives of different characters and a variety of how they deal with these challenges. The actors and actresses were just right for their respective roles. Definitely, "Relative Happiness" is not your usual rom-com movie. In RELATIVE HAPPINESS, Bergland plays 30-year old Lexie Ivy, owner of Ivy’s Bed & Breakfast. Desperately in need of a date to her sister’s wedding, in comes Adrian, a handsome and charming guest who seems to take an interest in her. Lexie thinks all her problems are solved, but she misreads the situation and is soon reeling, believing her romantic dream has slipped away, maybe forever. Lexie then needs to open her heart and eyes to see that love may be a lot closer than she thought. Based on the book by Lesley Crewe, RELATIVE HAPPINESS is a feel-good romantic comedy, with bits of drama peppered here and there. The feature is rated PG by the MTRCB, and shows in select cinemas starting December 9.